"Garden surprise" quiche, made in an actual quiche/pie dish I found at the thrift store for $1! Quiche may soon become a rarity due to the hens molting, so I'm enjoying this one quite a bit. The star of which is sweet Antigua peppers. They had a sad germination rate (1 in 5) and the one plant that did grow yielded only 3 peppers. BUT, they are the sweetest peppers I've ever tasted. I'm saving seeds from this one, hoping for a better season next year. Not pictured (but often accompanying) is a salad made of buttery tom thumb lettuce, which is thriving in the cold frame, and has me hoping for a steady supply of greens through winter. We'll see! I heart banana bread in my (also $1 thrifty find!) heart-shaped pan. 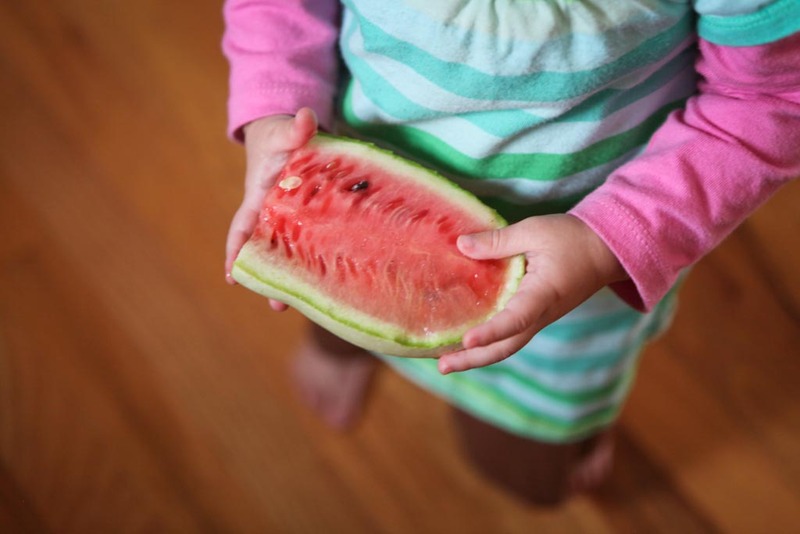 A pint-sized homegrown watermelon for my pint-sized girl. I've also (accidentally) mastered the skill of telling when a melon is ripe - wait for it to fall off the shriveling vine. Best watermelon yet. Who knew? 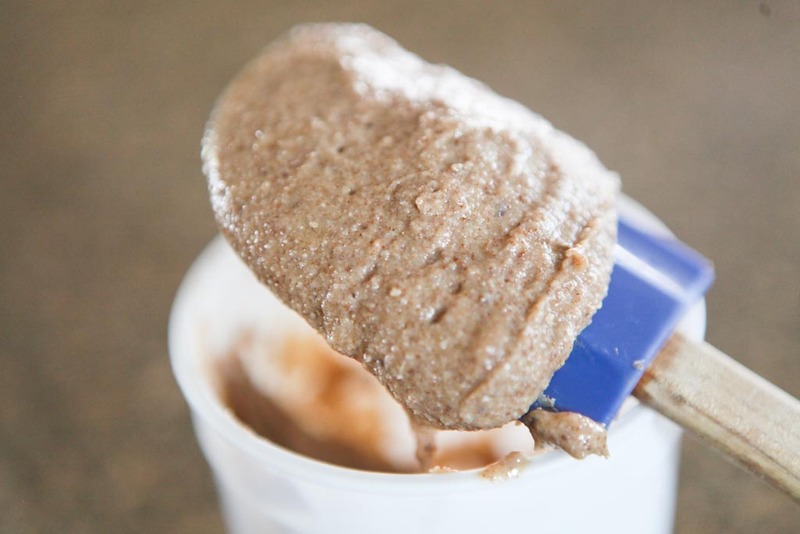 Almond butter, made simply by throwing a bunch of almonds and a little honey in the food processor and letting it rip until everything becomes creamy. Vietnamese yogurt, which is by far my favorite of all styles of yogurt; thick, smooth, and sweet. 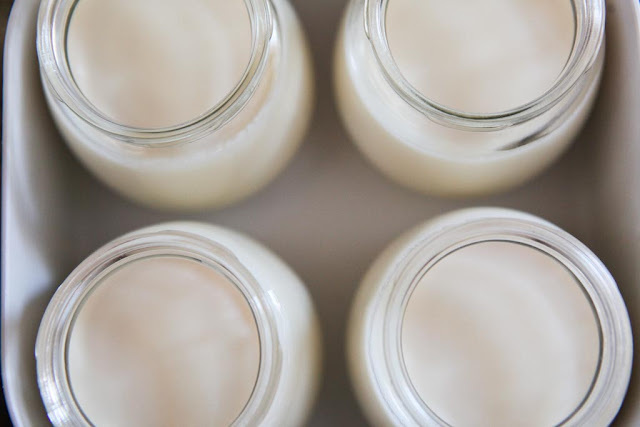 I use this recipe, but rely on my electric yogurt maker (after the straining step) instead of a water bath. 12-15 hours incubation time does the trick. 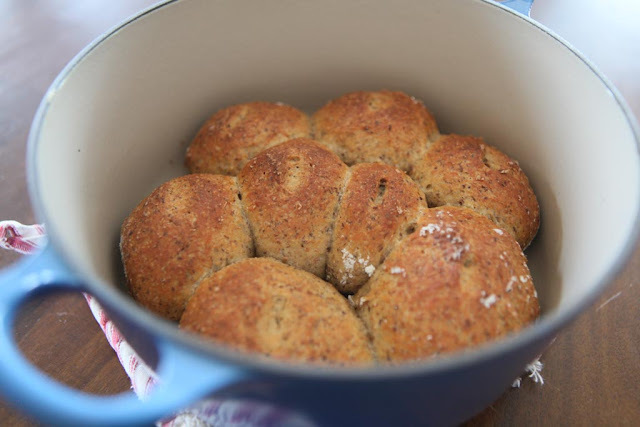 The 5-minute bread recipe also makes good (a tad chewy, but tasty) whole grain rolls. All colors of tomatoes make for the most beautiful pasta sauce. This year was most definitely the year of the cherry tomato. The first of our favorite soups have begun to make a regular appearance. 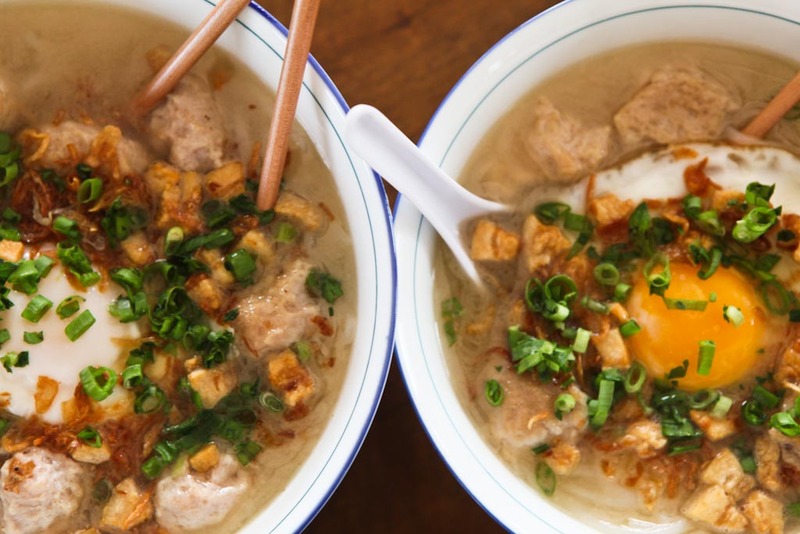 This is Vietnamese "hu tieu." Oh, my. This all looks SO good. I'm personally on a sweet potato topped with spicy kale kick but you've given me some inspiration to change it up! And by the way, I love your heart-shaped pan. I've been pining after a friend's for YEARS! My mouth is watering Jaime!! Thanks for sharing such inspiration!Love the sound of your almond butter...i have to give that a try! How yummy Jamie. I am making a tart today with fruit salad for supper. I will post about it later on today. I've been contemplating a quiche too with leftover goodies from the garden. We've started getting eggs from a co-worker because hubby doesn't think our dogs and chickens will mix, so I've put that on the back burner. I finally got peppers to turn from green to the color they are supposed to and I'm hoping we'll get more before frost. Oh the things you've been busy with in your kitchen look so yummy! 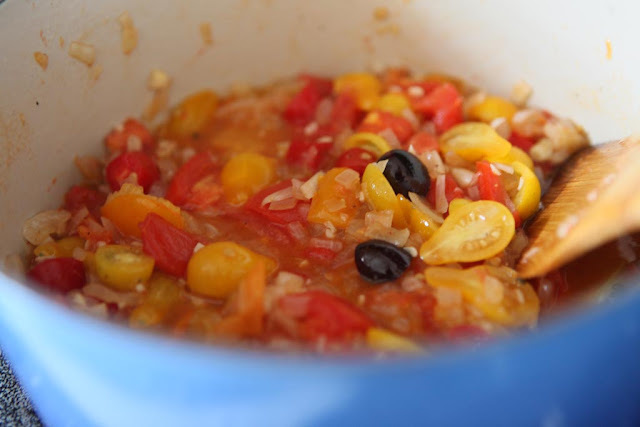 We made an all yellow tomato sauce that was lovely if a tad confusing for the brain. It looked like a puree of squash...but tasted like tomato! Oh yes, I think yellow ketchup would be fun, too! Mmmm.... 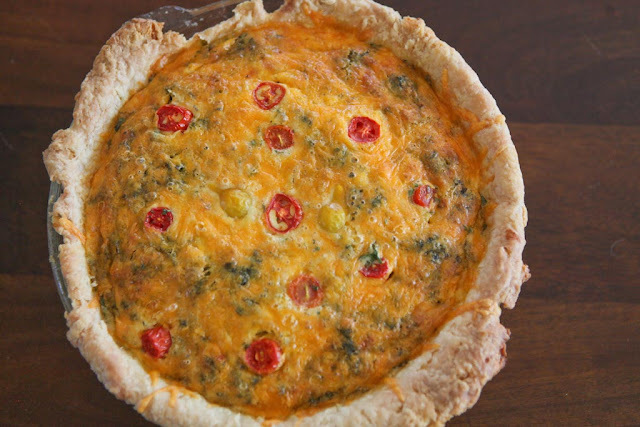 I need to make some quiche now! I've personally been on an oatmeal and tea (at any time of day) kick. Oh, and butternut squash and salads. I can't get enough of them! Thank the universe for giving us a thing called seasons. Thrift shop bargains are always the best! I've tried your bread recipe to some success as well. Love the pictures. Oh wow--you sure keep busy! It all looks SO good. Everything you make always looks delicious! Not sure how you do it, but you sure are good at it!!! Thanks for the inspiration! 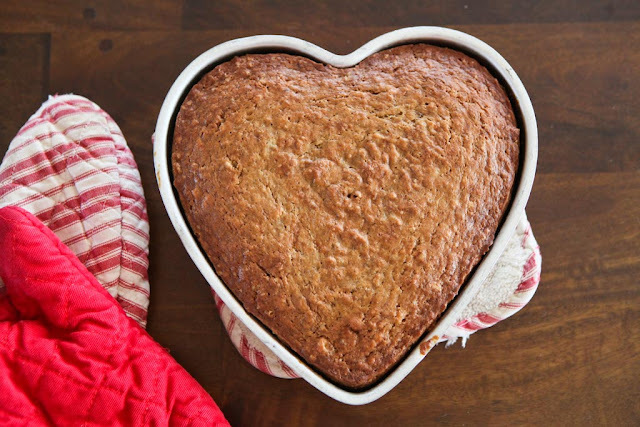 We just bought a Heart Shaped pan (due to Daniel Tiger's Neighborhood making a "love cake" which was Heart shaped banana bread) Did you just use a regular banana bread recipe for this? Was the cooking time any different? Thanks! Hello! The cooking time was the same as for a regular loaf pan. I use a very basic banana bread recipe, but I also add some applesauce to the batter. So yummy!